Indiana police are investigating a fight between two female Walmart shoppers, one of whom is heard urging her young son to join the fray by punching her opponent in the face. Video of the fight--which apparently occurred this month--was first posted to YouTube three days ago. As seen above, clips show the women brawling in the shampoo aisle of the Walmart SuperCenter in Beech Grove, a city six miles outside Indianapolis. 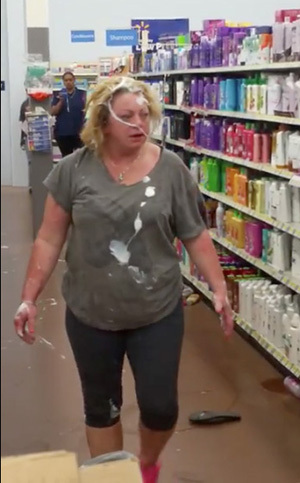 Seen below, another video of the brawl--which was shot by a second Walmart patron--shows the boy squirting shampoo or lotion on his mother’s opponent and then throwing the container at the woman as she gets to her feet. Over the next few minutes, the child is seen punching and kicking his mother’s prone opponent. He also struck the woman with items taken from store shelves and doused her in what appears to be shampoo or lotion. “I’m not playing,” the boy says at one point. While both women could face counts like disorderly conduct and criminal damage for their mutual combat, the boy’s mother seems to have further criminal exposure. In prior cases where parents have directed their children to start or join fights, charges have included child abuse, child endangerment, and contributing to the delinquency of a minor.